Warm sunshine on your face, a cool breeze blowing, and the smell of something delicious wafting over from the grill – what could be better? There are few summer Arkansas activities we love more than a backyard barbecue. 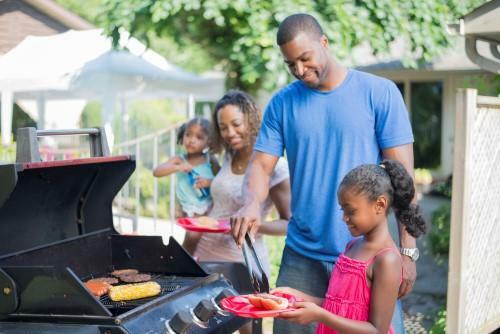 With so many families enjoying the long summer days gathered around their favorite grilled goodies, it’s probably no surprise that July is also the peak month for grill fires. Familiarize yourself with these quick tips to ensure your family fun isn’t interrupted by injuries – or a visit from the local fire department! Keep your grill where it belongs. Both propane and charcoal grills should always be used outdoors. Keep it a safe distance from your home, deck railings, and overhanging tree branches – anything that could be flammable. Keep it clean. When was the last time you thoroughly cleaned your grill? If you can’t remember, it’s probably time to give it a scrub. A build up of grease can cause some serious flame flare-up, leading to burn injuries. Purchase a quality wire grill brush and use it each time you grill. Keep close – but teach kids to keep their distance. You may be tempted to “set it and forget it,” but you should never leave your grill unattended. Children and pets are often curious about what’s cooking. It’s important to keep them at least 3 feet away from the grill at all times. Thermal burns are the leading cause of cooking-related injuries. Keep it cool – then heat it up! We can’t forget the importance of food safety when we discuss good grilling practices. Food poisoning is no joke! To avoid the risk, keep your meat refrigerated until you’re ready to place it on the grill. Before serving it up, check the internal temperature of those hamburgers and chicken kabobs; poultry should be cooked to 165 degrees Fahrenheit, and burgers are safe at 160. And of course, if you smell gas while cooking on a grill – or a gas-powered indoor stove – immediately turn it off, get away, and call the fire department. Gas leaks can cause serious injury or death. Keep these grilling tips in mind, and keep the fun going at your next summer cookout! If you or someone you love has been injured in a grilling accident due to a defective product or the negligence of another person, you may have legal rights to compensation. The personal injury lawyers at Taylor King Law work every day to help Arkansas accident victims like you. When you call 1-800-CAR-WRECK, you’ll get a free consultation with Taylor King, whether or not you hire our firm. We’ll be on your side, by your side, every step of the way. You’re one call away from getting help today!